Maybe Loire Valley wine isn’t at the top of your list when it comes to aged wine from France. Though certainly there are plenty of sweet white wines from the Loire that can last for decades, if not decades after you’re in the ground. (Sorry to be morbid.) But Muscadet, the dry, bracing white wine made from the Melon de Bourgogne grape near the coastal area of the Loire Valley, certainly is not one that first leaps to mind. Youthful is how I drink 99% of my Muscadet, and I presume the majority of people who enjoy this wine do so as well. And there’s certainly nothing wrong with that! But after being reacquainted with some bottles of Muscadet with a few years of age on them, I’m thinking it’s time to wave the flag a bit for aged Muscadet. Now, I’m not saying these wines have spend an astonishing amount of time in the bottle. But for a wine that’s drunk up fresh, enjoying Muscadet that’s 7 and 13 years past their vintage is a real eye-opener. 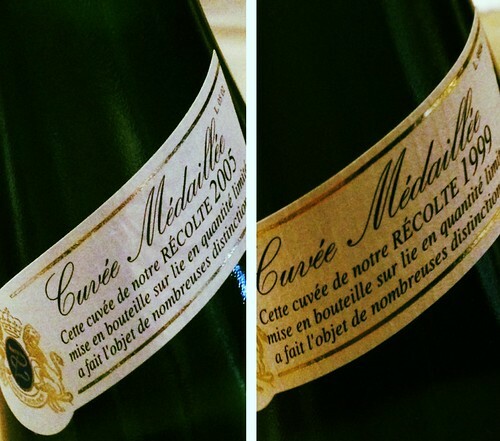 The duo of Muscadets pictured at the top were the Le L d’Or bottling from producer Luneau-Papin. These wines had become a little richer, a bit more golden, but still had a lively, well, Muscadet-ness. And while it’s natural to think “oysters, oysters, oysters” with Muscadet, cooked seafood, vegetables, and salads are also a fine option. 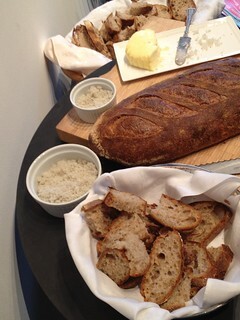 But I think I discovered a most unlikely and humble new pairing for Muscadet; bread, butter, and salt. (Now, this was not Wonder Bread with margarine and iodized table salt.) The richer, aged Muscadet was great with the creamy butter and the sea salt perked up and highlighted the salty, briny character of the wine. (Just like an oyster.) And if you are dying to know more about Melon de Bourgogne, the grape responsible for Muscadet, you can buy a copy of my e-book from The Beginners Guide to Wine series. Written with the utmost attention to accessibility and approachability, it will have you racing to your nearest wine shop for a bottle of Muscadet. Call ahead and have them chill one down for you, ok? Big thanks to the Loire Valley Wine Bureau for putting on this event and Suyama Peterson Deguchi for hosting it in their totally cool space. Thanks, Laine. So glad I made it. Absolutely agree – drank a 2011 recently and it portrayed a delightfully mellow, butter and nuttiness about it.